Mexico Vacations- Gray Whales - Eschrichtius Robustus, Baja California - Mexico. Looking for a great vacation spot? Check out the Baja, for Mexico vacations! I spent several days in this beautiful region of the world which is crammed with desert landscapes, lonely beaches, and an array of wildlife. I chose my Mexico vacations based on the gray whales who use the waters surrounding Laguna San Ignacio as a nursing area. 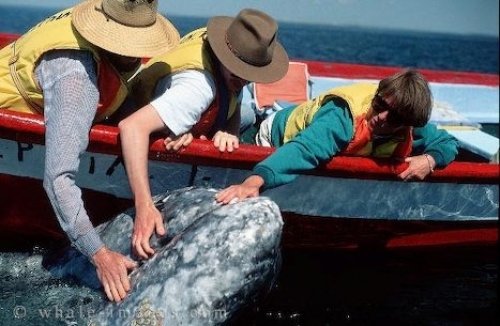 Picture of three tourists touching a Gray Whale of the Mexico coast.